Hey guys! I bought a Fallout trilogy bundle (FO, FO2 & FO:T) a couple of weeks ago to play FO and FO2 for the first time. FO came pre-patched with 1.2 (if I recall correctly) and with a high-res patch. Played it with the provided High-Res executable, finished it without any bugs or troubles, and I loved it. Today I installed FO2 (which had no high-res patches like the first game), and I get an "Error initializing video mode 640x480". 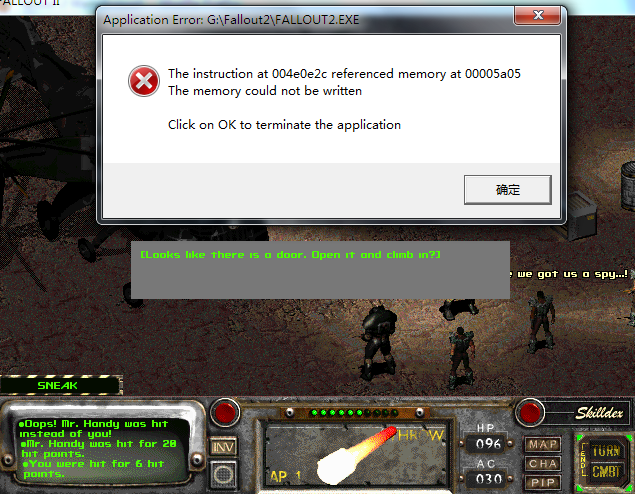 I tried using Fallout2 High Resolution Patch 2.2c (and 2.2b), but it wouldn't work. Next I patched with killap's 1.02.27.1 patch, (and the High Res one) but I still get the same error message. Changing the compatibility mode didn't help, nor did "Run in 640x480 screen res". I even tried deleting Patch000.dat (which I guess was installed with the game). BTW, I'm on XP SP3, but I should try it out on Windows 7 tomorrow. Any suggestions on how I might fix this? tl;dr: Error initializing video mode 640x480; What do? I'm currently playing through Fallout 2 with the most recent copy of the restoration patch at a revelation of 1280x720. I have gotten to the Raider Base on the map I'm stuck because the map will not scroll over far enough to see the exit grid so I can't leave. Restoration Project issues don't belong here, this is only for the unofficial patch. Did you install the resolution patch separately or did you use the version that comes in the RP installer? This would be a map edge issue, but it really shouldn't happen. Then again perhaps something was modified that I'm not aware of. I'll look into it. I used a separate installer for the resolution patch, however, I believe it was the same version that went with the restoration project. You overwrote the settings that came with the Restoration Project. There is no need to install anything besides what comes with the Restoration Project installer. Please reinstall. Hmm, I know it might be my own problem, but can I fly to Enclave base using the yellow key card I found in Klamath? I've killed everyone in Navarro except the cook, but I can't find any entrance or door on the vertibird. I even tried to use the key card on it, but nothing happened. Wrong thread. Flying to the Enclave is no longer possible in the RP, as it doesn't appear to have been intended. Flying to Navarro is possible though. Not relevant to you now though. Sorry, I just found the RP gameplay thread. I'm using latest unofficial patch (1.02.27.1). For some reason Tandi didn't mark Vault 15 on my map. I checked the scripts and it looks like she was not supposed to do so in unpatched version as well. So I went to Vault City main computer and tried searching the archives for the location of Vault 13, which was supposed to give me the location of Vault 15 instead. But choosing this option ended dialog immediately. I still was able to get the Vault 15 location from VC travel log as I exited the dialog in the normal way, so it's not a big deal, but still looks like a bug to me. And could be a bit more of a problem if I didn't have PE 7, as it seems that it isn't possible to get Vault 15 location elsewhere. Well, I guess I could just walk there anyway, but it feels like a kind of cheating to me. P. S. I also couldn't decompile the script using int2ssl 1.55, it said "Invalid opcode at 0x0000174a". The game crashed when I clicked teh vertibird after following Wright's children to the desert. hope someone can help me getting rid of the patches because I dont know where they are installed. If this is of any help: I just downloaded, clicked on the patch file. It opened a wizzard, installed the thing and then I 'finished installation'. 1 - edit your post instead posting twice, it's not elegant. 2 - did you read the documentation of the mod and patch? 3 - if the documentation doesnt say it, why are you sure the mod can be used with the patch? I also have the problem with the shopkeeper in Red 888 Guns in San Francisco who isn't storing any, well, guns. He only has money (and is only restocking money) and I get the same barter screen for every table or if I talk to him directly. Any solutions so far? Not a game breaker in any way, but it's still crappy because a my friend told me he's the only one who sells the Gauss Rifle. I could also use a save game from you. Please post it online somewhere or e-mail it to the address in the readme of the patch. Alright, found the problem. Some RP code slipped in, which rendered the tables useless. Fixed in upcoming unofficial patch release. When I try to install the patch into the FO2 file I get an error message saying that I can only install it to the Fallout installation directory. There is only one single FO2 file which I can install the patch to though. I don't know what I'm doing wrong, any suggestions? I'd appreciate your help very much!! The installer is looking for Fallout2.exe. Wherever that file lies is where you should install to. I assume you are running Vista/7? Not sure if this is covered or not but on my game (Base FO2, Unofficial patch, high-rez patch, sfall) Swift Learner perk doesn't seem to be effecting combat, and possibly quest, XP... I use First-Ad skill and get 26 XP, I kill a rat and I get 25 XP.. I went further through when I noticed this and killed a tougher opponent (Pig Rat) and once again only received the standard 75 XP. Update to the unofficial patch to coincide with the RP 2.1.2 update. • Game would consistently crash after killing Lenny the supermutant in the ring. This is no longer the case. • Tables in Red 888 Guns in San Francisco would never stock weapons. Some RP code slipped in by accident. This has been corrected.